Ah, summertime. We invite the season of beach days, ice cream cones, outdoor parties, and leaving the layers at home. But for the urban-dwelling commuter, the heat can be a true nightmare. Yes, there is simply nothing more vile than a subway platform on a hot day. Last summer, I lived in New York City (sans air conditioning, I might add) and commuted to SoHo three days a week from Upper Manhattan. If you've ever had a similar experience, you know that the subway during summertime rush-hour is akin to one of Dante's Circles of Hell. The cars may be air conditioned, but they certainly don't feel that way when you're packed in like a can of sweaty sardines or waiting on a humid platform. No matter how much of a subway aficionado you may consider yourself in the middle of winter, once the 90 degree weather hits, all bets are off. So what's a city-commuter to do? Lucky for you, we've amassed plenty of tips and tricks to prevent you from melting into a puddle on the floor of the subway car, Wicked Witch of the West-style. 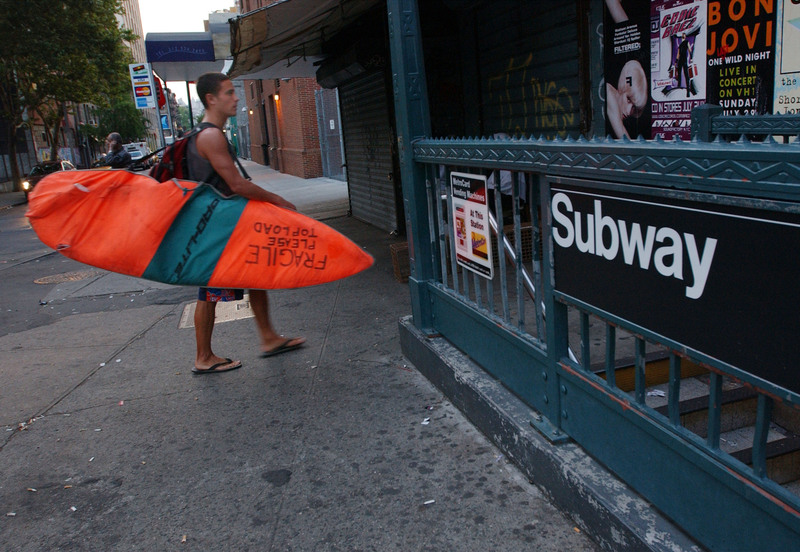 Take it from me — the subway in the heat is evil, but it's a necessary evil. And you can survive. Here's how. You might think that light, "summer" cardigan or scarf looks cute when you leave the house, but once you descend into the darkness that is the subway tunnel, you'll be desperately peeling off layers until all that's left is skin. Best to save the energy and start out almost naked. Service changes, delays, and just-missed trains are the worst, no matter the weather. But when it's hot, you really want to spend as little time on the platform as possible, since it tends to be about a million degrees. Unless you look like Beyonce when you sweat, download an app (I recommend Embark for NYC-residents) to keep you up-to-date on service changes and estimated arrival times. You're going to want to get where you're going, fast. The smell of his General Tso's chicken will be so strong in the heat that you'll feel like you're eating it too. You should probably never eat elaborate meals on the subway (it's just so rude) but in the summer, everything smells stronger. You'll never get the sticky feeling of powdered sugar off after you inhale that Cronut. It will be hot. You will be thirsty. Iced coffee (and a water bottle) are key. I know, I know, seats are key to a tolerable subway experience. But if too much of your thigh is exposed, your skin will wind up fusing to the plastic seat. Trust. Sandals seem like the only acceptable footwear in the heat, but there's little worse than having your exposed toes smashed in by a temperature-oblivious man in steel-toed boots. Be prepared. You'll want to distract yourself while on the boiling hot subway, but books and magazines run the risk of disintegrating in your sweaty palms. Load up your Pocket app with all those lengthy think-pieces you never have time to read. It's not sweat, it's glow!